This recipe is easy to prepare kappa recipe. Generally consumed this as a evening snack. The sweetness of the onions and coconut and the roasted dried chilli, mustard seeds lots of flavours and taste merge together and gives a wonderful experience in each bite. Simple yet delicious tapioca recipe. Even kids like this preparation. Easy to be prepared in minutes. Best snack with a cup of tea. Especially at this rainy season. Love the eat with Chukku Kappi or Kattan Kaapi. Try this evening snack. Boil some water and cook the tapioca with salt till it hold its shape but not mushy. Heat oil in a pan and add the mustard seeds and dried red chilli. Once the mustard seeds crackles, add the onion and allow to cook for a minute. then add the curry leaves. Now add the tapioca and coconut and mix well. Allow to cook for a minute and add salt if required. 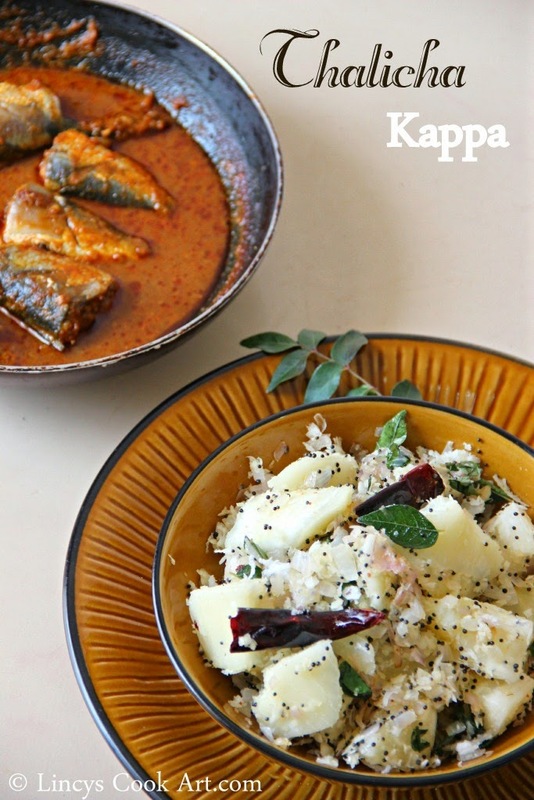 Kappa and meen curry, omg i want to finish that plate.. Cant resist to this combo. Nice recipe dear. i really like your all recipes and the way how u present them is so good. Wow..this looks absolutely yummy dear...drooling here ! !